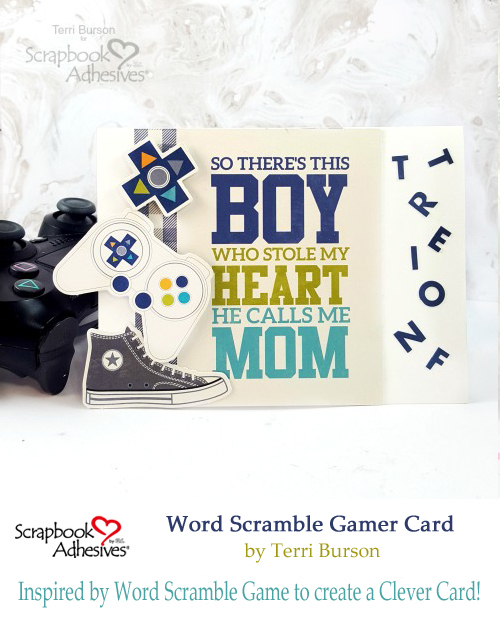 Hello, my crafty friends, Terri here, with a Word Scramble Gamer Card. 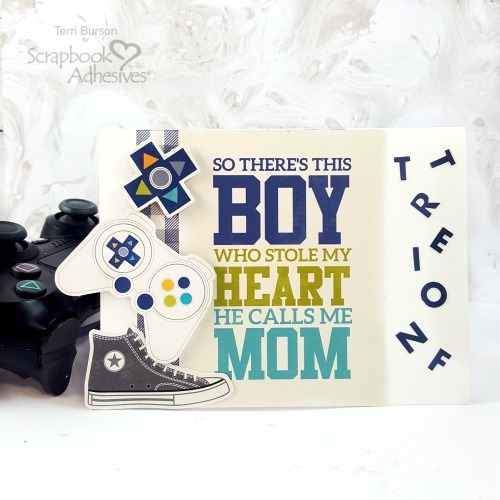 My son was the inspiration for this card, and Jillibean Soup has the perfect paper collection to pull this off. Stick around for just a few minutes because this word scramble card has secret clues to unscramble the word. The kids are going to love this! The Jillibean Soup “2 Cool For School” Paper Collection Kit turned out to be the perfect collection. 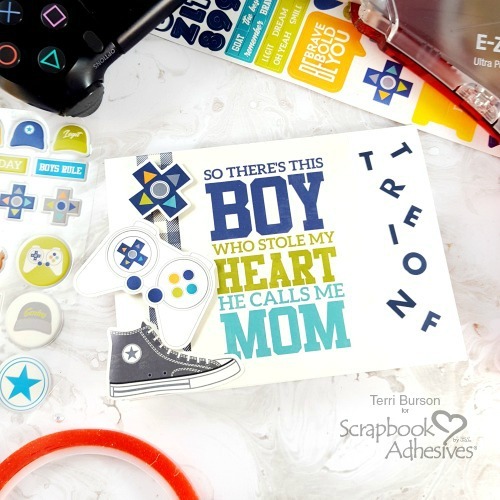 It’s chock full of boy stuff, puffy stickers, journal frames, die cuts and the most amazing double-sided patterned paper. Deciding which direction to take can sometimes be a challenge, but not this time. Gaming is a big part of many of our kids lives (adults too!) and this was the perfect theme for what I had in mind. For this project, I kept it as minimal as possible. 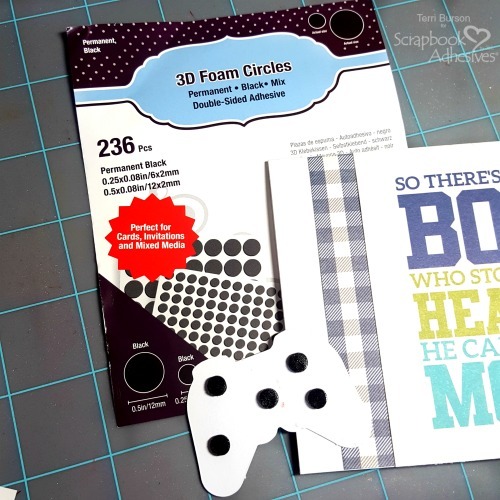 Besides the collection kit, you’ll need a white A2 side-fold card, scissors, a trimmer, and your adhesives. You’ll need just a bit more white cardstock for the clues, but I’ll get to that later. As you can see in the photo above, the 3D Foam Circles Black Mix will be used on all my die cuts, to pop up for added dimension. 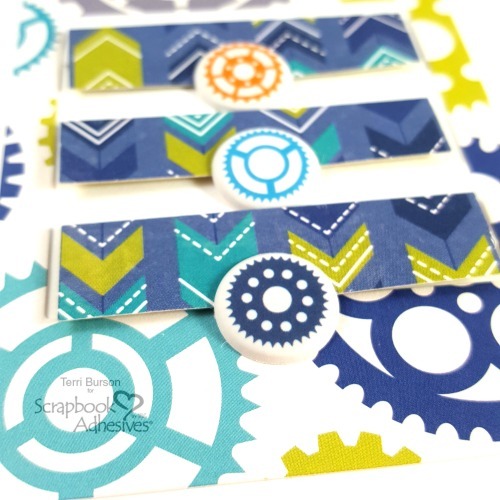 Adhere the journal frame to your A2 card with some trimmed plaid paper included in the paper kit, using the E-Z Runner® Grand Refillable Dispenser. 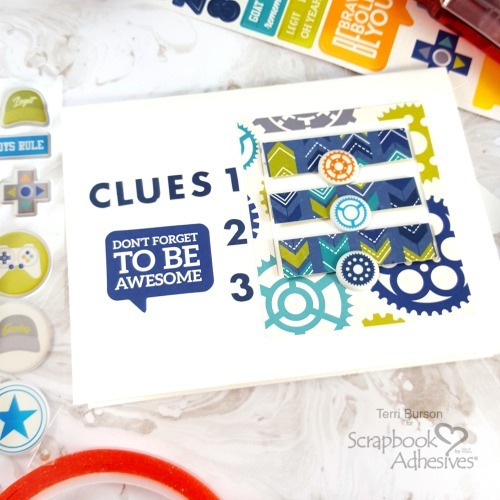 Add your scrambled word to the right edge, using the alpha stickers also included in the paper kit (as seen in the last photo below), for your gamer card. Gaming involves a lot of strategy and problem solving, at times. I thought it would be fun to have the clues on the back of the card. The sticker frame included in the kit was just right to frame my trio of clues. Each tab was scored and folded and has a written secret clue to solve the scrambled word. I trimmed some white cardstock and adhered the inside and backside with my Extreme Double-Sided Tape 1/2in. Those puffy sticker circles serve as the closure for the folded tabs and are so easy to gently peel and reveal! Simply apply more alpha letters, numbers and stickers to the back to direct your kids. Shall I reveal my clues? 1. Summer 2. Game 3. PlayStation. Have you figured it out yet? This was the hottest game this summer, and every kid I know was playing it. You guessed it, Fortnite! It’s still super hot and all you have to do is ask your kids or grandkids. Trust me, they’ll know what you’re talking about. If you’d like product links for the products that I’ve used today on my Word Scramble Gamer Card, stop by my blog at Waving My Wand. Thanks so much for popping in today! This entry was posted in 3D Foam Circles, Adhesives, Beginner, Cards, Crafts & Tutorials, E-Z Runner® Grand, Extreme Double-Sided Tapes, HomeHobby by 3L, Permanent Adhesive, Skill Level and tagged 3D Foam Circles Black Mix, Card, Card Making, E-Z Runner Grand Dispenser, E-Z Runner Grand Permanent Strips Refill, Extreme Double-Sided Tape 1/2", Interactive, Jillibean Soup, Neenah, Terri Burson, We R Memory Keepers. Bookmark the permalink. 2 Responses to "Word Scramble Gamer Card"
I loooovvee this! thanks for the details!